Raila Odinga speaks at a past event. Courtesy photo. KENYA–Governors Jackson Mandago and Stephen Sang have warned NASA against causing a constitutional crisis whose aim they claim is a power-sharing deal with Jubilee. The general election took place on August 8 and IEBC said President Uhuru Kenyatta won but the Supreme Court found the constitution and the law were violated. The court cancelled Uhuru’s win following a petition by NASA chief Raila Odinga and a repeat will now take place on October 26. But the Opposition says this will not be the case as long as those who committed irregularities are still in office. Mandago (Uasin Gishu), Sang (Nandi) and several Rift Valley MPs said the fresh election will take place as planned since NASA does not have the capacity to stop it. The leaders asked Raila to give up on elections and let Uhuru be sworn-in if the Opposition is not willing to participate. 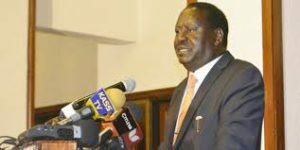 Steven Sang says Raila should not hold Kenya at ransom by pushing his demands. Courtesy photo. Sang said the NASA principal, who has vied three times before, should not hold Kenya at ransom by pushing his demands. The county chief further claimed that the court’s judgment arose from a scheme with the Opposition. He spoke during a funeral at Mosoriot in Nandi county on yesterday. 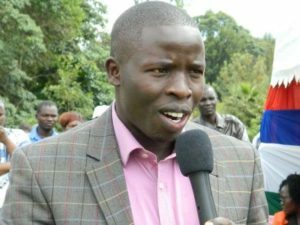 His were echoed by Deputy Governor Yulita Mitei, Senator Samson Cherargei, woman representative Tecla Tum, Kapseret MP Oscar Sudi, Alfred Keter of Nandi Hills, Chepsumei’s Wilson Kogo and Cornelly Serem of Aldai. The leaders said the current political situation is undermining the county’s economy and stability yet NASA does not want to resolve it through a vote. They condemned the Supreme Court, led by Chief Justice David Maraga, saying judges “snatched” Uhuru’s victory. The politicians further said Uhuru defeated Raila on August 8 and will do so again on October 26. “We have read the detailed judgment released by the Supreme Court have found no credible evidence that made the judges nullify Uhuru’s win,” Keter said. The President claimed the majority judgment against his victory was reached without the analysis of crucial documents. He has once said the Opposition chief wants a power-sharing deal but Raila has denied that this is the case. Mandago, who spoke separately, said Kenyans will not accept violence resulting from NASA leaders’ pushes for personal interests. He asked NASA not to disrupt or boycott the repeat presidential election because Jubilee will protect Kenyans’ rights to vote. He added the National Super Alliance should be supporting IEBC in preparations for the election so the people exercise their democratic right to choose the leader of their choice. The Governor noted peace will prevail as Kenyans have remained calm despite the political tension. The Governor further said on Friday that leaders should be able to disagree politically while preaching unity and progress after the election.